Updated for ATC 160. The Chicago Teachers Union, taking on “Mayor 1% Rahm Emanuel, is preparing its members and the community for a possible fall strike in defense of quality public education. Download the PDF of this story here. WHETHER OR NOT the Chicago Teachers Union (CTU) will strike this September is an open question. But the issues they raise are gaining national attention. Although the CTU has not been out on strike since 1987, 23,780 out of 26,502 union members voted to authorize a strike last June if an agreement cannot be reached. There were only 482 no votes. Almost 90% of the entire membership approved the action, easily surpassing the required 75% set by a new state law Senate Bill 7, which was intended to block Chicago teachers’ right to strike. As the attack on teachers has escalated over the past two years, CTU members felt “We had no choice” but to vote to strike. Given that one of the architects of Chicago’s school “reform” agenda, Arne Duncan, has extended those policies nationally as president Obama’s Secretary of Education — through initiatives like Race to the Top — the consequences of a strike loom large. 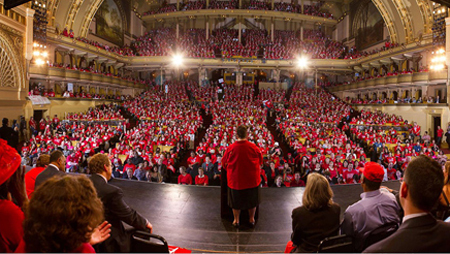 In May, just before the strike vote, an inspiring rally and march of over 7,000 teachers through downtown Chicago revealed the results of a two-year campaign of organizing, unifying and educating the CTU membership. It was also a validation of the new Caucus of Rank and File Educators (CORE) leadership that has united the union in opposition to the privatization agenda of the Chicago Public Schools (CPS). That agenda was initially fostered by Arne Duncan and has continued under “Mayor 1%” Rahm Emanuel. The anti-union school “reformers” assumed that the teachers would vote on whether to authorize a strike following the fact-finding report. Because the report would likely be issued over the summer, they assumed it would be difficult to get the necessary 75% vote. They also expected that the report would be limited to pay and benefit recommendations while remaining silent on key concerns such as length of the work day, class size, job security and union proposals to hire additional staff and expand curriculum. Additionally they expected the report would accept the financial limits of what the school board claims to be a $600 million deficit. Board spokesperson Becky Carroll called the report “shocking.” It clearly dealt a blow to Rahm when it stated that the Board could not expect to compel teachers — who already work a 58 hour week, according to a recent University of Illinois study — to work longer hours without compensation. It also didn’t accept the idea of “merit pay” that the Board proposed to institute. Instead it recommended that the current step (experience) and lane (education) format for wages be maintained. The fact finder proposed, because the school day was to be lengthened by 19.4%, that wages be increased by almost 15% in the contract’s first year. The report was rejected by both CTU and CPS, for very different reasons. The CTU House of Delegates unanimously rejected the report because there was no recall procedure for displaced teachers. It also failed to deal with important issues like class size limits, enrichment of the curriculum through access to fine arts, computer literacy and physical education. The pressure on the Board, however, induced them to make a major concession as they negotiated a portion of the contract dealing with a longer school day. Instead of requiring teachers to work a longer school day, the classes would be staffed by hiring 700 teachers and offering those positions first to a pool of unemployed teachers. Further, the programs in the extended day would include arts and physical education at many schools, a portion of the enrichment curriculum that the CTU had been advocating. According to George Schmidt of Substance News, “this is the first time in 14 years that the Board has made this concession.” Not only has the Board backed down on trying to compel teachers to work more for no more money, but they have negotiated a “permissive issue” (i.e. a permitted subject for collective bargaining if both parties agree) on what the longer day would look and established a precedent in hiring displaced teachers. Chicago has historically been one of the most segregated U.S. cities, a fact reflected in its schools, most of which are overwhelmingly Black, Brown and poor. Rather than truly desegregating schools, the city has created a parallel set of well-funded selective enrollment schools, leaving neighborhood schools segregated, still inadequately resourced. In 2004 the CPS introduced “Renaissance 2010,” a program inspired by the Civic Committee of the Commercial Club of Chicago, a business-based advocacy group. This plan called for the closure of low-performing schools and their replacement by a mixture of charter, contract and “performance” schools. All would have new staff, although some would still be unionized. This was the plan that Arne Duncan, former CEO of the CPS, instituted. By the end of his tenure, 60 public schools had closed and 65 charter schools opened, enrolling about 5% of the students. Since then the number of students enrolled in charters has more than doubled, to 12%. Now the current Board of Education projects doubling charter enrollment to 20% within the next five years. Various charter operators have benefited from multiple State of Illinois grants totaling more than $100 million. Many are politically connected. Juan Rangel, United Neighborhood Organization (UNO) CEO, was a co-chair of Rahm Emanuel’s election committee. Another important player is the Academy of Urban School Leadership (AUSL), founded by venture capitalist Martin Koldyke. AUSL now has 12 turnaround schools with six more planned for the future. Charters have a lower proportion of special needs students, and most are models of what the education reformers would like: a longer school day, lower pay scales, no tenure and total flexibility in staffing and class size. Average test results for charter students are no better than those of Chicago students in regular public schools, and in many cases worse. One of the future challenges of the CTU leadership will be its ability to unionize the charter schools. If a school is “turned around,” the entire staff from principal and teachers to lunch ladies is fired and the Local School Council (which gives elected parents, staff and community representative some control over principal hiring and the school budget) is removed. Changes in state law in 1995 took away the rights of displaced teachers to take vacant positions in other schools. Over the past three or four years nearly 3,000 experienced teachers have been let go; many were replaced with mostly newly trained (and less expensive) teachers. At this point some schools are on their second or third episode of “school reform.” Since the 1990s schools have undergone reconstitution, re-engineering, intervention, a breakup into small schools, reconsolidations into one large school, transformation, and turnarounds. Is it any surprise that teachers grow cynical when education reform from above is foisted on them and their students? This Chicago-style reform was partially responsible for the rise of the CORE leadership. After thousands of teachers lost their jobs, it was obvious that schools were increasingly resource starved and the union was being structurally weakened. Along with introducing charter schools, the state legislature passed legislation prohibiting the union from bargaining over almost any issues other than wages and benefits. It turned over control to the mayor, who now appoints the Chicago school board. The union leadership’s response to this continual erosion of rights was ineffective. This led to the rise of an opposition within the CTU. Debbie Lynch formed a group called the Pro Active Caucus of Teachers. (PACT) that won election in 2001 over the lackluster Tom Reese of the United Progressive Caucus (UPC), which is allied with the national leadership of the American Federation of Teachers (AFT). Although very heterogeneous in political ideology, PACT had an articulate leader in Lynch, who was willing to fight the changes that were being imposed. She also looked back to the more militant leadership style of Jackie Vaughn, who led the union through a series of strikes in the 1980s. But PACT found itself in a protracted struggle with the defeated UPC, draining its energy. Unable to find a way of involving the membership, PACT negotiated a contract that was rejected by the membership. Although the contract, renegotiated with modest improvements, passed the second time round, PACT was narrowly defeated by the old guard in 2004. The next six years of UPC leadership saw more job losses and an ineffective and divided union. PACT’s attempt at a comeback in 2007 wasn’t even close. At this point the Caucus of Rank and File Educators, started by a small group of young militant teachers but including longtime union activists, some of whom had been active in PACT, met to form a new caucus that took as its goal the need to fight to oppose the privatization agenda. They understood the need to involve parents and community groups in this fight. The group decided to propose actions within the CTU, but not wait for the union to act — to begin activities at any school where there was opposition to the Board agenda. This ranged from speaking out at CPS hearings in support of parents’ actions against school closings, opposing CPS policies, and camping out at schools threatened with closure. The more activities that CORE engaged in, the more they attracted teachers willing to fight for the education of their students — and the weaker the UPC leadership looked. As the 2010 union election approached, CORE decided to contest the election against a splintered UPC and the still functioning PACT. In the first round no candidate won a majority, but in the second vote members were willing to vote against an ineffective incumbent and in favor of a group that had two years of increasingly militant activity. While CORE received 60% of the vote, this amazingly rapid rise to leadership was possible because of the UPC’s lack of leadership — people wanted change, but the membership was not yet sold on CORE’s perspective of social unionism. 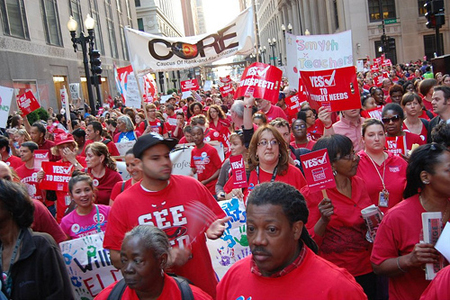 In the summer of 2010 the new CORE-led CTU was immediately faced with an attack by the school board, who wanted the union to give back $100 million or face large layoffs. They claimed a $1 billion deficit. When the new CTU leadership refused, 1,300 teachers were dismissed. This dispute and its resolution set the tone over the last two years as the economic “reality” was the Board’s justification for violating the contract and ignoring tenure rights. It also established that CORE was not going to back down. CORE decided to reorient the union from one that provided, at best, a service to its members into an organizing model, capable of both educating and mobilizing the membership. One notable new program was the creation of an organizing department tasked with internal and external organizing. The organizing staff worked to strengthen the internal union organization by making sure that every school is represented in the citywide House of Delegates, the body that runs the union through monthly meetings. The staff makes sure there is an open line of communication between delegates and the executive board. They began organizing regular rallies, marches, sit-ins, and other actions designed to build the confidence of rank-and-file activists across the union and increase support for a broad social agenda. The department’s second function is to build ties to community and parent groups. This has resulted in the creation of a community advisory board at the union with parent, community and advocacy groups so that everyone can discuss common needs and plan shared campaigns. Currently the board’s member organizations are leading a campaign to place the issue of an elected school board on the ballot in selected wards this November. The formation of the community board demonstrates that the CORE-led union is serious about building community alliances, and not just using them as a support mechanism. This approach is essential in finding common ground among groups that have been historically pitted against each other. CTU promotes a vision of a “better school day” with an enriched curriculum — a curriculum like that in private schools such as the University of Chicago’s Lab School, where Rahm sends his kids. This has been important in countering the Emanuel and CPS CEO Jean-Claude Brizard mantra that a longer school day equals a better education. (See The CTU report, “The Schools Chicago Students Deserve”: http://www.ctunet.com/quest-center/research/the-schools-chicagos-students-deserve. Adding staff in the union requires additional resources, and CORE has done this by restructuring how union staff are paid. In the UPC-led CTU, high salaries, expense accounts and better pensions made the job a very lucrative one. Today people are paid according to the salary schedule that applies to teachers, with the only difference being a 12 rather than 10-month position. While the city has perennially headlined hundreds of millions in budget deficits as a pressure tactic to force concessions upon their unions, the CTU has been creative in spotlighting how property tax revenues that should be for the schools and libraries are siphoned off into Tax Increment Financing (TIF) districts, supposedly used to foster economic development. When a TIF district is created, any rise in property tax revenue is taken out of the general revenue fund for a 23-year period. Schools, libraries and public health services lose this revenue (estimated at a $250 million loss for the schools alone), which is often diverted to surprising projects like $23 million to the Chicago Board of Options Exchange to remodel their bathrooms, several million to help build a new showroom for a luxury car dealership, or $5 million to help build a new Hyatt hotel (coincidentally owned by the Pritzker family, a member of whom is on Rahm’s school board). The Board of Trade was once led by David Vitale, whom the Mayor has appointed as president of the school board. Publicity over the TIF issue has resulted in groups like the Board of Trade being shamed into returning some of the money. A second CTU campaign, in conjunction with community groups like Stand Up Chicago and Action Now, has been against banks, such as Bank of America, which have drawn community anger over foreclosures. Foreclosures have a devastating impact on minority communities. They also reduce the property taxes that fund schools. CTU has also pushed toxic interest debt swaps, where loans to CPS held by banks should be renegotiated to take advantage of the low rate of interest that the Federal Reserve is currently giving to banks. A potential $40 million a year in interest might be saved. Ultimately, this campaign must widen its scope to deal with the major contradictions of funding public education primarily through property taxes. The system leads to huge inequalities among taxing districts. As long as property taxes remain the revenue base for public schools, there will be a tug of war between overstressed taxpayers and the needs of schools. Ever since Bill Bennett, Secretary of Education under Reagan, famously declared Chicago’s schools the worst in the nation, politicians have stated that education is a “priority.” When Emanuel won election last year, he immediately began campaigning for a longer school day, clearly aiming to portray the teachers’ union as being against the needs of the children. One of the difficulties facing the CTU has been to respond to the endlessly repeated statement that Chicago students spend 1½ fewer hours in school than students in Houston. Of course the quality of education isn’t equal to the number of minutes students spend in a classroom. If it were, the University of Chicago’s Lab School would be unable to attract parents willing to spend more than $20,000 a year. The difference is obviously about quality, class size, support and resources. The “better day” as opposed to the “longer day” requires more explanation. Public polls done by the Chicago Tribune, a bitter foe of the CTU, has shown some encouraging support for teachers. In a May poll support for the longer day was 62% to 32%. This was down, however, from January 2011 when the numbers were 78% in favor with 17% opposed. More importantly, when asked about whom they side with in the debate over improving education, 40% supported the CTU with only 17% supporting Emanuel. Among Chicago public school parents the numbers are higher, with 48% supporting CTU over the Mayor. Nearly all respondents felt that teachers should be paid for longer hours of work. Emanuel’s most visible supporters are astroturf groups like the infamous Jonah Edelman-led Stand for Children, Advance Illinois, and Democrats for Education Reform. All campaigned for SB 7 and all like the longer day. The head of Stand for Children — which once was a grassroots organization — injudiciously bragged about using contributions from wealthy donors, like the Gates Foundation, to make it impossible for Chicago teachers to strike. Emanuel has had less success in building grassroots support for his policies. One attempt to show community support for his longer school day and school closures backfired when the media discovered that those bused to the meetings were paid $25-50 to carry signs and claim to be parents. One minister who organized that effort, Rev. Roosevelt Watkins of Bethlehem Star M.B. Church, is CEO of the HOPE Organization. HOPE received $1.47 million in CPS contracts since 2010 and additional payment from an Emanuel-connected public relations firm. Media exposures have made such gimmicks more circumspect. Things have not played out the way Rahm and CPS anticipated. They face a CTU that has unified its ranks behind a broad set of demands and garnered significant public sympathy. But at the beginning of August, the way forward to what can be considered a union victory isn’t clear. While the wage and salary schedule proposed by the mediator by itself would probably be accepted by most teachers, other issues still on the table include recall rights, limits on class size, staffing ratios, school resources and CPS’ intention to restructure the pay schedule and institute test-based merit pay. While the CTU has public support, CPS has attempted to isolate the teachers by settling contracts with three unions who represent other board employees, SEIU, UNITE-HERE, and the Operating Engineers. The members of those bargaining units are sympathetic to the teachers, but their leaderships either felt pressured under threats to privatize the work or lacked the confidence in attempting to confront Rahm in a united front. These unions have no-strike provisions in their agreements so the possibility that during a strike 600 schools would have some staff inside is worrisome. Other Chicago unions, particularly the building trades, are supportive of Rahm’s use of TIF funds for private development projects. They don’t criticize the loss of revenue for schools and other public services. Another set of unions, including AFSCME, the transit unions and firefighters, are also facing difficult negotiations in the near future and should find common cause with the teachers. Some people speculate that if the strike comes in the midst of a close national election between Obama and Romney, it may provide some added leverage for the CTU. Anger over a Democratic mayor, especially one so closely associated with Obama, attacking teachers who are standing up for a better education for their students could be a public relations debacle — but would it affect the election? Illinois is safely in the bag for Obama, but could it hurt him in swing states? One effect that can be predicted is a tremendous amount of pressure brought on the CTU to settle on the part of the various Obama supporters, from unions like the AFT to civil rights groups and others who fear the election of Romney. If the CTU is firm in fighting for both the rights of its members and the needs of students, this pressure to settle could be resisted and the delicate political situation can work to the advantage of the union. Everything depends on the CTU’s unity of purpose, and the members’ ability to continue to make the case for the 400,000 students in Chicago who deserve a quality public education. Teachers have taken a courageous step in opposing the forces of privatization. If they can win this fight, it will give hope to millions whose standard of living is under attack today and point a way to organize against the forces of austerity. For the latest information, go to the CTU website at http://www.ctunet.com/. You might be interested in their 46-page report, “The Schools Chicago’s Students Deserve” at http://www.ctunet.com/quest-center/research/the-schools-chicagos-students-deserve.